Enjoy a 90-minute group tour exploring the Royal Palace Madrid, the official residence of the kings of Spain. You will explore the palace accompanied by a local guide who will share their knowledge about the grand living quarters of Spain's royalty. Marvel at the many palatial features, including the main staircase by Sabatini, the Throne Room, the Hall of Alabarderos, the Royal Chapel, and more. 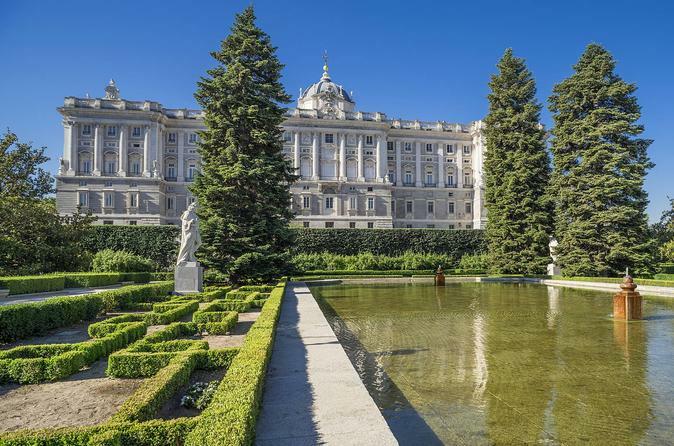 Take a 90-minute journey though Spanish history on a guided tour of the Royal Palace in Madrid. Visit the official residence of the kings of Spain and one of the top attractions in Spain’s capital city. In all, the palace features 3,000 rooms that have been perfectly conserved, and you’ll be able to visit some of the most spectacular during the tour. Designed by Sabatini, the main staircase has over 70 steps. Visit the Throne Room, and admire the ceiling painted by Tiepolo, and the Hall of Alabarderos (the palace guards). Your guide will also point out works of master artists along the way. In the Royal Pharmacy you’ll see cabinets with medicinal plants, ceramic pots and formulas dispensed to the royal family. Visit the Royal Chapel, and see its collection of stringed instruments made by the legendary Antonio Stradivari.